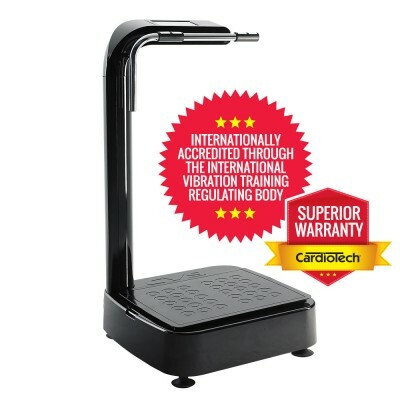 Cardio Tech CV9 Vibration Platform - Pacific Fitness, Inc.
+ Stunning Australian design - Now You Can Access All Critical Positions! + Plus World Leading Strength & Toning Program! SUPERSIZED PLATFORM – 72% LARGER! The CV9 is the only Vibration machine with this corner post design. The difference... you have optimum access from all 4 sides of the platform, rarely found on Vibration machines. Enjoy more lower body and seated positions, superb for yoga, massage and stretches! Perfect for core stabilising muscles. This intuitive and engaging display guides you through the CV9’s programs prompting your selections and input of vital info... simply... quickly... at a touch. TREAT YOUR BODY TO DEEP TISSUE MASSAGE! This mat is custom designed by a leading Massage Therapist, Steve Lockhart and uniquely crafted to gently relieve pressure within sore muscles... just like a deep tissue massage! Get the most from your CV9! We’ll help you achieve your goals and meet your personal Vibration Training needs with our team of experts! More power, more reliability. An optimum heavy duty 400W DC capacity! Means you have power to burn without it costing you a fortune. Includes the internationally proven Toning and Strength Program endorsed by the International Vibration Training Regulating Body – takes just 10 minutes! Parts always in stock... guaranteed! THIS MACHINE IS MANUFACTURED IN ONE OF THE TOP FACTORIES IN THE WORLD SPECIALISING IN VIBRATION!! Higher Hertz - Means Faster Results! For strength, metabolism & weight loss, toning and tightening! 90% of our competitors just offer up to 15hz!